Liverpool’s Bold Street is no stranger to great coffee, with the eponymous Bold Street Coffee leading the way for many years. More recently, it’s been joined by a host of others, including, on nearby Wood Street, Mother Espresso, and now, on Bold Street itself, Ropes & Twines, which describes itself as a “Coffee and Wine Room”. Perhaps taking the lead from the likes of Filter + Fox, Ropes & Twines offers coffee and wine in a high-class setting, including a rather awesome set of cellar rooms, along with sandwiches, cakes and charcuterie (the only other coffee shop I can think of offering coffee, wine and charcuterie is London’s Fernandez & Wells). When it comes to the coffee, there are two single-origins, one on espresso, one on pour-over, both roasted for Ropes & Twines by Maude Coffee in Leeds. 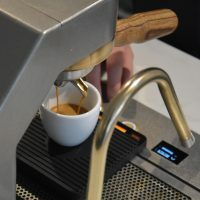 In keeping with the elegance of the setting, Ropes & Twines has dispensed with the usual bulk of the espresso machine, instead going with what I believe is the UK’s first Mavam espresso system outside of London. This modular system hides the boilers and pumps out of the way, just leaving the group heads and steam wands rising above the counter.